Ever try to mount an entire work of Shakespeare in a week? Try it sometime. R.A.D.A., London, and London Theatre - "The Merchant of Venice"
We are moving into the final two weeks of our program here at RADA and my group will be performing an adapted version of "The Merchant of Venice". Our director and program leader, Nona Shepphard, adapted the script down to about ninety minutes. I am playing the role of Antonio who is the "merchant" spoken of in the title. Many of the other roles are being doubled and tripled up. It should be very interesting, because these actors will often be on stage at the same time. For instance, there are two actors playing Shylock, and often they will be on stage simultaneously. Often they will be saying lies in unison and other times not. I think it can create a very powerful experience. We only have ten days to get this thing up and running. Thankfully that's all we have to do now. The other group is performing an adaptation of "Julius Caeser" and "Anthony and Cleopatra". We will each be doing three performances. Independence Day, the 4th of July, in London. "What should I do?" I asked myself yesterday morning. Fireworks are out. BBQ is out. England, the defeated motherland, would not be celebrating the revolt of those rascals across the pond. Canada Day, last week, they celebrated with gusto. Canada broke up with mommy in a very civilized way. So, looking through Time Out London, I found the perfect occupation on my day of celebration, I would attend a play about Martin Luther King, called "The Mountain Top" showing at Theatre503. It was the last day of the run, and the Theatre503 is part of the "fringe" here in London. That means it's not on the touristy West End, but somewhere in the middle of London, in an area I had not yet explored. So I bought my ticket to the show, got out my various tube and bus maps and planned my route. I left an hour early to make room for the inevitable getting lost factor. It turned out that my vigorous advanced route planning paid off. I got there with forty five minutes to blow. 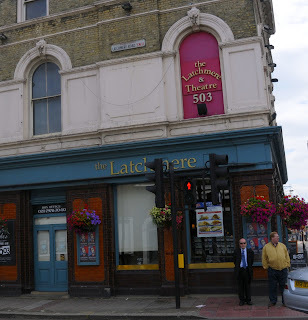 Theatre503, is located above the Latchmere Pub near Battersea Park. On this day there were a few dozen rabid rugby fans, tilting back pints and yelling; the television sets placed in all corners of the place. I ascended the stairs in the back of the pub which led up to the theatre. Suddenly the atmosphere changed and I was struck by the difference. Below me in the pub, there were Londoners drinking and yelling, and now I was in a sort of holy place of art. It was quiet, patrons sat around drinking soft drinks, waiting for the show to begin. "The Mountaintop", by Katori Hall, a young female African-American playwright, graduated with MFAs from both Julliard and Harvord! She's already written numerous plays and acted in numerous plays all around the world, and guest starred in good number of movies and television shows. Whenever I read about people who accomplish this much, the first thing I wonder is, "do they ever sleep?" The reason the maid is mysterious is because she is actually an angel from heaven come to take King back to God (who we learn is actually a black woman who uses a cell phone to communicate with her angels and saints). The script was funny and moving, light and heavy, ridiculous and poignant. I found myself getting annoyed, when in the middle of the very realistic play, we were suddenly expected to believe that she is a messenger of God. It reminded me of the play "Prelude to a Kiss" in which we are asked to believe something ridiculous after having been led down the path of realism. However, the actors' commitment to the moment and the story, soon wooed me back to the play, and by the end I found myself once again enthralled. 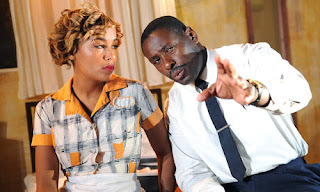 I was impressed by the way the British actors in this play took on perfect southern U.S. black accents of the 1960s. The only thing that I found sort of bothersome at the beginning is that Harewood spoke, throughout the entire show, in that famous vibrato baritone that King used in his speeches. It was spot on in it's sound, but I can't imagine that King sounded like that when he was in a casual setting. This distraction soon was gone from my awareness as Harewood's commitment to the situation and embodiment of King was extraordinary. Well, that's it for now. I have to get to work on my scene from Julius Caeser!